I felt inspired last night to make a painting of some sort. And since I can’t paint, I thought I would enlist James’s help. He loves to paint. 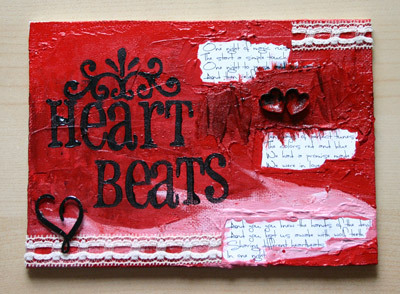 We altered two canvases to tribute two favorite songs. James of course, took like 4 hours to do his. He’s such a perfectionist! But I love the way it turned out. 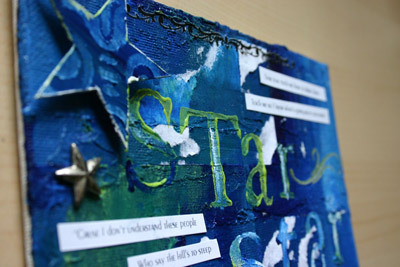 I’m trying to convince him to do an art journal with me! And look at my silly girl! I took this pic last night. It’s a little dark, the lens on our slr is only 5.6, but I like it. 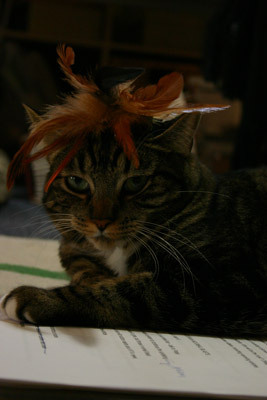 She’s so dignified – even with a feather birdie on her head! wow. these are great guys! I think it’s in the air, this need to paint. I am feeling it too, but I dunno if i can do a real painting. 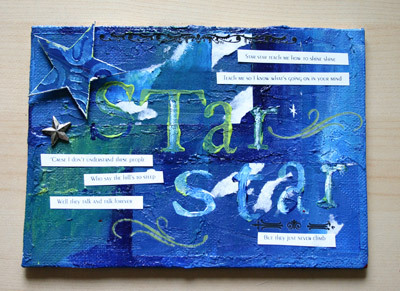 but i did have fun doing my art journal. Sooooo cool!! How big are they? Where are you hanging them? awww feather birdie hat totally suits your little lady! I love the two pieces that you and James did. Glenn is only crafty with wood…hm, must brainstorm us a project! 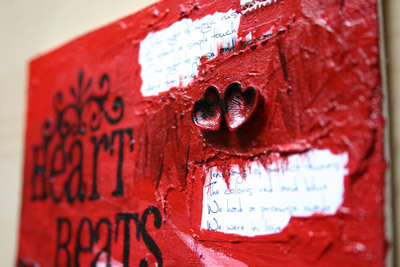 Gorgeous canvases! Funny pic of your cat. They LOVE things on their heads!